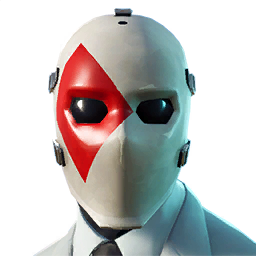 The Wild Card is the name of one of the legendary male skin outfits for the game Fortnite Battle Royale. Outfits change the appearance of the player, but do not have any added function or benefit except for aesthetical. The Wild Card features a mysterious male avatar wearing an all-white tuxedo suit with a black necktie. The avatar also features a white mask that can be customized to represent different cards such as the ace of clubs, the ace of diamonds, and more. The outfit is customizable with four different card suit masks. 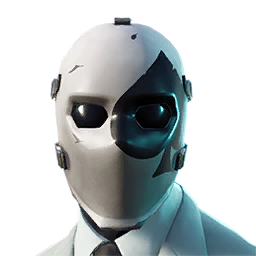 This skin has 4 selectable styles that can be used in-game, check below. This legendary costume is part of the Getaway Gang Set. Purchasing the outfit also grants the player a legendary back bling called Cuff Case. This outfit can be purchased in the Cash Shop during the 2018 event called High Stakes Event (also known as Getaway Event). Part of the Getaway Gang set. Wild Card high-quality PNG images with transparent background to use them as you wish (YouTube thumbnails, skin concept and so on). Wild Card rotation history in the Fortnite Shop. Below you can see the first and last time when Wild Card could be bought from Item Shop, also how many days it was seen and the dates list. 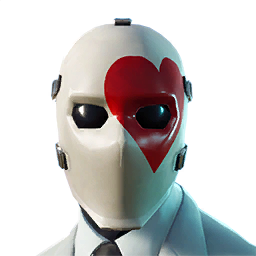 This cosmetic item can be re-added in the future, so check the store regularly. i cant view it in 3d but sick skin thanks for all your hard work on this page keep it up. Is this going to be coming back or not? I didn’t know they were just going to have it for one day. I personally would not recommend this skin. However, if you own this skin or decided to buy it, I suggest doing the “Wiggle” emote in front of a random players face during the pre-game lobby. It’s one of the funniest sites ever! Note: Please reply to this comment if you’ve done this and perhaps include a link to a video so others can see. <3 this skin 110/100 great overall colors and my fav design is the hearts one but sadly i didnt get it when it came out. RIP in spaghetti and never forgetti. 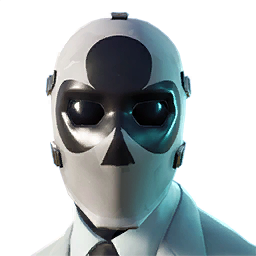 Can I get this skin I realy like it and if epic games has a chanel I will sudscribe and I will like the chanel to but lastly I will also make all epic games players that play fortnite my friend.